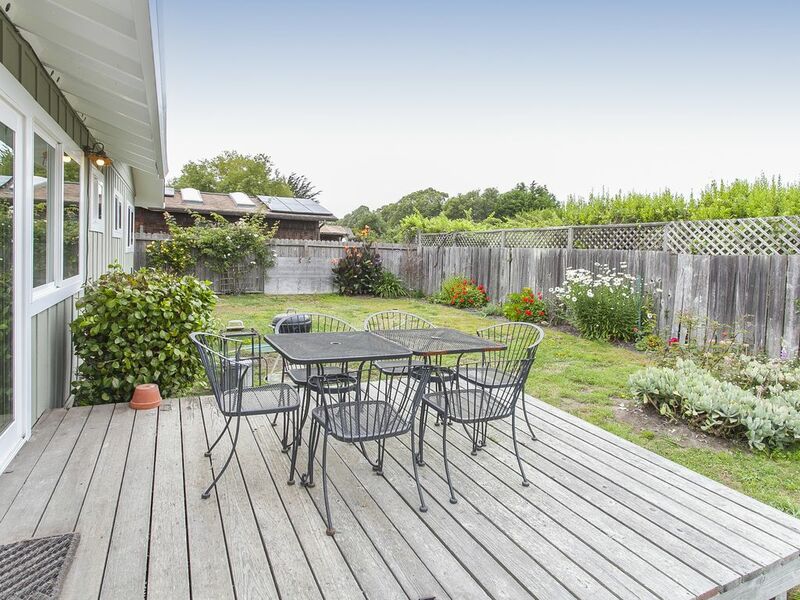 This light-filled house is on a level lot with a completely fenced back yard, with wooden deck, barbecue and lots of roses. The living-dining-kitchen area has peaked ceilings, an open floor plan and a wall of windows to the back yard and a gas stove-fireplace. There is another deck by the front door to catch the late afternoon sun. Walk out the front door and turn west onto the quiet, virtually traffic-free dirt roads of the Bolinas' 'big mesa.' In two short blocks you are at the southern border of Pt. Reyes National Seashore -- a huge, grassy meadow leading from a horse ranch over the the bluffs above the Pacific (on a clear day you can see the Farallones). Or walk a few blocks south to overlook the surfers off Bolinas and Stinson Beach and to San Francisco and Devil's Slide further south, and then continue down the road to town and the beaches. front and rear decks, fully fenced, flat back yard. Every detail is well thought out and it feels being at someone’s home. The owners are wonderful to speak to. Would love to come again. Thanks. This house was a cozy and charming place from which to explore Bolinas, Stinson, Point Reyes and the greater West Marin area. Everything about the house was easy - from the check-in to the well-stocked kitchen, to the five minute walk to a glorious ocean sunset view. Hosts Hilary and Don were very communicative and easy to work with. My favorite part was probably enjoying a cup of coffee on the deck and watching a family of quail pass by. Highly recommended! Thanks, that was very kind. Happy New Year! Clean and comfortable 2 bedroom home. Up the hill from downtown Bolinas but a short 4 minute drive. Nice home, adequately furnished and equipped. Good getaway for us to detox from the hectic daily grind in the valley. Very good hikes from a mile to 14+ miles within 10-15 minutes of the home. Weather doesn't get too hot at all here in Bolinas - needed light jackets in summer. The house is nice and has all the amenities including comfy beds. No Tv. Which made family time memorable. Nice to unplug! The yard is adorable and sweet! We contacted Hilary when we were looking for a place to evacuate from the wildfires. She was responsive and kind. We were able to go to the beautiful property in Bolinas with our toddler and two senior dogs. We breathed fresh air for the first time in days and were so thankful. The property was clean, well appointed, and the backyard is a wonderful place to relax while enjoying the garden. Thank you for helping us through a crisis, and for being very gracious hosts. 15 minute walk to town and beaches, two blocks from southern border of Pt. Reyes National Seashore with great hiking along the coast, quiet location in the sunny part of Bolinas mesa - great walking and biking on calm, rural dirt roads (3 houses off paved Mesa Road), close to Neiman Ranch, in the summer there are lots of blackberries nearby to pick for dessert.